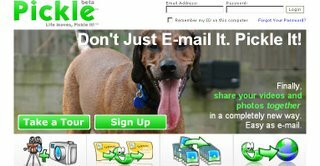 Pickle is a new online service that lets you upload and share not just photos, but also videos with friends and family over the Internet. Pickle is like an album but better. After you registered you can creat vivid video and photo albums that call Picklebox. Pickleboxs are for personal media-video & photos. It has two ways to upload your stuff: website & email.